"There is a place in you where there is perfect peace. There is a place in you where nothing is impossible. There is a place in you where the strength of God abides." Grow spiritually, emotionally ─ completely. A Course in Miracles is one of the most extraordinary and important documents of the 20th century. It's been read, studied, and accepted by millions of people. It is considered by many to be the most divinely inspired work since the Bible. The wisdom contained within the Course transcends anything you've heard before. What is our purpose on Earth? Answered. How do we live in this world and remain happy? Answered. How do we find meaning in our lives? Answered. What is our true nature - spiritual or physical? Answered. Why must we experience pain, illness, and suffering? Answered. What are joy and sadness? Answered. What is the meaning of our relationships with each other? Answered. What is our relationship with God? Answered. to these questions and more. Never has such a profound spiritual document been so clear, easy to access, easy to learn from, and, most importantly - easy to personally benefit from. It can help you grow spiritually and emotionally and can increase your personal joy and effectiveness in every area of your life. It's a step-by-step program, a true self-help course for spiritual development. You'll find that the power of your love can literally change your view of the world around you. A Course in Miracles can be the "rock" that carries you through tough times. Its teachings continue to elevate you to greater accomplishments and contributions to the world around you. A Course in Miracles teaches you a new way of thinking and interacting that can produce miraculous results. While the Course is a spiritual product, it is the psychological applications it teaches that are so important in the world we live in TODAY. Today A Course in Miracles is available in an unabridged audio format from Nightingale-Conant. Having the Course on audio gives active people like you a distinct advantage. You can give yourself the time to listen even when you don't have the time to sit down and read. Study the Course while driving to work, preparing dinner, gardening, or even jogging down a lonely beach at sunset. With audio learning you are free to learn anytime, and the world around you becomes your classroom! But what is this Course in Miracles, anyway? Read on, Truth Seeker. We know exactly where A Course in Miracles came from, and how it came into being. It's the how that tends to shock our rational, modern minds - as it should! It certainly took the two main participants in this true-life drama by surprise! Our two heroes, Helen Schucman, Ph.D., and Bill Thetford, Ph.D., were both doctors and research psychologists in the Psychology Department at Columbia University's College of Physicians and Surgeons in New York City. Bill was in his late 40s and the head of the department. Helen, 13 years older than Bill, was a senior member of his staff. They were both agnostic in belief and trained in rational scientific principles. Their professional credentials were impeccable. In fact, Bill had even been involved in the Manhattan Project as a young researcher at the University of Chicago during World War II. Neither had ever experienced anything that would prepare him or her for what was to come. It all seemed to be triggered in June of 1965. Right before a meeting they were about to attend, Bill said to Helen, "There must be a better way of living and working in the world, of handling our personal and professional problems, and I'm determined to find it." Thinking Helen's response was going to be a laugh, she surprised him by saying, "You're absolutely right, Bill. We'll find this other way together." And that was the beginning of a joint commitment the two of them made. It was shortly after this when Helen began to have strange visions and hear what seemed to be an "inner voice" in her head. The situation distressed her greatly, and she told Bill she thought she was "losing her mind." He reassured her that she was functioning perfectly well and not losing her mind. Although she was initially frightened, Helen began to listen to the voice. She knew that this is the way Einstein claimed to get inspiration, as did the great playwrights and poets. She put pen to paper and began transcribing the words of this inner voice. Frightened, she stopped writing, and stopped listening. Days later, she mustered up enough courage to listen again. It took her seven years to transcribe the entire Course. What was this strange Voice Helen couldn't ignore? If it had happened to anyone else, Helen and Bill would never have believed the Voice was anything other than a delusion of the subconscious mind. Certainly not a spiritual experience! But something kept them going for more than seven years. What was it? It was the words - so compelling and so beautiful - that made them keep going! And they began to notice real results in their lives as soon as they began applying the principles. Their work environment, which had been the site of constant political conflict and rivalry, became a place of helpfulness - even though the workload had increased! This story is well documented, although it is difficult for anyone not to be skeptical. If you take the opportunity to listen to A Course in Miracles, however, you will find less reason for skepticism. Why? Again, it is the words and the results! You'll shake your head as you listen to A Course in Miracles. The words are so beautiful and powerful and true that their validity is almost impossible to deny. The words "feel" right. In the bestseller A Return to Love, Marianne Williamson discusses the origin of the Course in this way: "The Course does not ask the listener to believe or have faith in the traditional way. It welcomes doubters. It asks only that you practice the daily exercises in the Workbook for Students within the context of studying the principles in the Text and let your emotions and the results in your life be your guide." Students learn rather quickly how much better their lives can become when they apply the principles for themselves. In applying the Course, you will find truth for yourself in your own way. Your faith and your confidence in the Course will grow with experience. In a Nightingale-Conant audio program called Love Is Letting Go of Fear, by Gerald G. Jampolsky, M.D., he describes his first encounter with A Course in Miracles like this: "I certainly wasn't looking for a personal transformation, a spiritual transformation, or God. I'd been a militant atheist all my life, ever since high school when a dear friend was killed in an automobile accident. "In my 40s, my life was in great chaos. My 20-year marriage had ended in a very painful divorce. I became an alcoholic. I had developed an incapacitating back pain, called degenerative back syndrome. And even my medical license was in jeopardy. "It was about this time that a friend of mine presented me with a Xerox copy of these three books called A Course in Miracles. "What happened was one of the most amazing experiences of my life. I heard a little inner voice saying, 'Physician, heal thyself. This is your way home.' I felt at that moment an experience that goes beyond words. "There was an instantaneous memory of God, the feeling of oneness with everything in the world, and a clear direction that my life would be led in the service of helping people." Since then Dr. Jampolsky has done just that. He created The Center for Attitudinal Healing for terminally ill children. He pioneered a student exchange program between Russia and other countries long before the fall of the Berlin Wall. He is the author of numerous bestselling books. He lives a miraculous life every day. You'll find that following the Course really is a better way of living. It offers principles that, if followed, lead to better relationships with all people and a better relationship with yourself. This is not difficult to comprehend because the Course is perhaps the clearest, most specific spiritual document ever conceived. There are no parables, riddles, histories, or stories of any kind. It says what it means, and it is what it says. A Course in Miracles is a guide for finding a better way of life. It can help you heal all your relationships, feel more keenly the joy of living, heal yourself, and develop a greater sense of inner peace. The great beauty of the Course, especially for us "21st-century skeptics," is that it never asks to be believed. It simply asks us to believe our experiences. Students of the Course can follow their own 365-day test of the basic principles and discover how it can work miracles in their lives. A Course in Miracles asks only for participation and application from the student. In its gentle but definite way, it becomes very challenging and confronting. And yet it always seems to follow effort with reward. As you begin to notice that there is a miracle for you around every corner, then you understand that the Course is working and becoming true for you. However, you are taught by the Course not to make distinctions between miracles - that it is no more difficult to move mountains than to move hearts. At its most basic level, the Course teaches self-mind-control, that ultimately we have only our fears to conquer. You learn that it is in your own best interest to forgive (not forget) the past because it no longer exists and it can no longer hurt you. In learning how to control your thoughts, you are striving toward the state of "true perception" that is the opposite of how you see the world today. The nature of true perception is that it has no limits, no categories, no hierarchies, no judgments. As you develop this ability, you learn to see the world for what it really is. A Course in Miracles says that "You cannot change your mind by changing your behavior ... but that you can change your mind." Learning to love, to forgive, to release guilt, and to stop passing judgment is not easy. Forgiving your enemy isn't a sentimental task; it's a revolutionary transformation of your entire world view. It takes a conscious choice to defy your past conditioning and beliefs. The Course helps with this transformation by giving you a 365-day set of exercises that teaches you how to replace ingrained, fear-based thought systems with those that are based on love and forgiveness. YES! I'm ready to embark on my 365-day journey to replace fear-based thoughts with love and forgiveness. Through this miraculous gift, I'll transcend all limitations as I live each day with true contentment and inner peace! 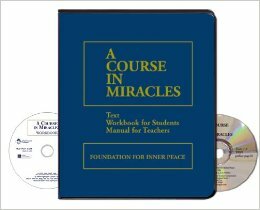 Please send me A Course in Miracles today - including 59 CDs and a 14-page audio guide so I can get the absolute most from the Course for JUST $149.95, which is $350.00 off the regular price of $499.95. If I don't transcend all limitations as I live each day with true contentment and inner peace, I will simply return the program within 30 days for a full refund. No questions asked.